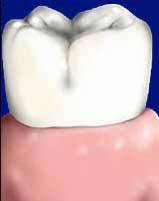 Tooth bonding is the application of a tooth-colored resin material using adhesives and a high intensity curing light. 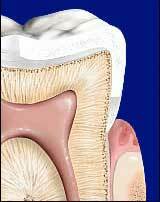 The procedure gets its name because materials are bonded to the tooth. Bonding is typically used for cosmetic purposes to improve the appearance of a discolored or chipped tooth. It is also used to close spaces between teeth, to make teeth look longer or to change the shape or color of teeth. 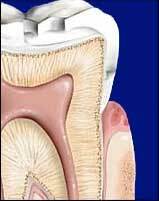 Often times bonding is used as a cosmetic alternative to amalgam fillings, or to protect a portion of the tooth’s root that has been exposed when gums recede. 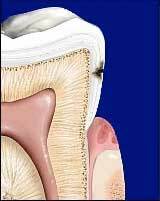 Step 1: A molar with decay that must be removed, and a restoration placed. Step 2: The decay is removed and the outline of preparation can be seen in cross section. Step 3: A tooth colored composite restoration is placed. Step 4: A final view of the tooth with restoration placed and the new restoration almost invisible.